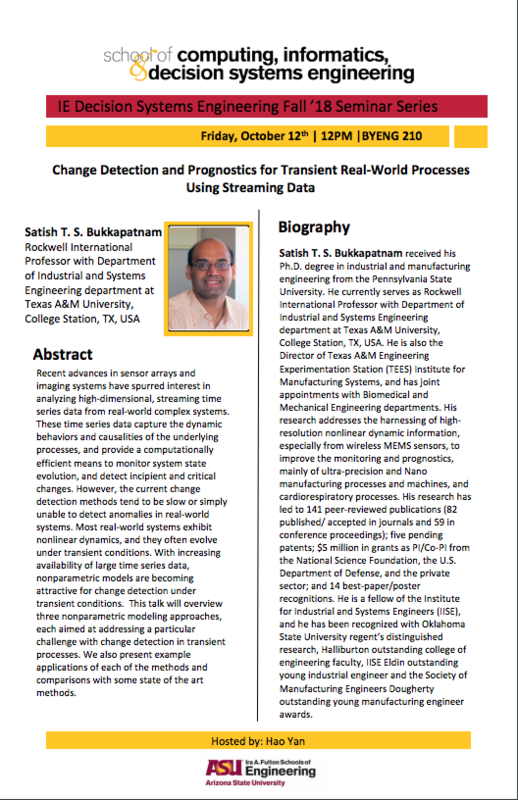 Satish T. S. Bukkapatnam, Director of Engineering Experimentation Station Institute from Manufacturing Systems, outlines advances in sensor arrays, imaging systems and time series data in this Invited Talk, hosted by Hao Yan. Recent advances in sensor arrays and imaging systems have spurred interest in analyzing high-dimensional, streaming time series data from real-world complex systems. This time series data captures the dynamic behaviors and causalities of the underlying processes and provide an efficient means to monitor the system-state evolution and detect changes. However, the current change detection methods tend to be slow or unable to detect anomalies. Most of these systems have nonlinear dynamics and often evolve under transient conditions. With increasing availability of large time series data, nonparametric models are becoming attractive for change detection under these conditions. This talk overviews three nonparametric modeling approaches aimed at addressing a particular challenge. We also present example applications of each of the methods and comparisons with some state-of-the-art methods. Satish T. S. Bukkapatnam received his doctorate in industrial and manufacturing engineering from Pennsylvania State University. He is currently at Texas A&M as Rockwell International Professor with Department of Industrial and Systems Engineering department and as Director of Engineering Experimentation Station Institute for Manufacturing Systems. His research focuses on harnessing high-resolution nonlinear dynamic information to improve monitoring, prognostics and cardiorespiratory processes. He is a fellow of the Institute for Industrial and Systems Engineering.